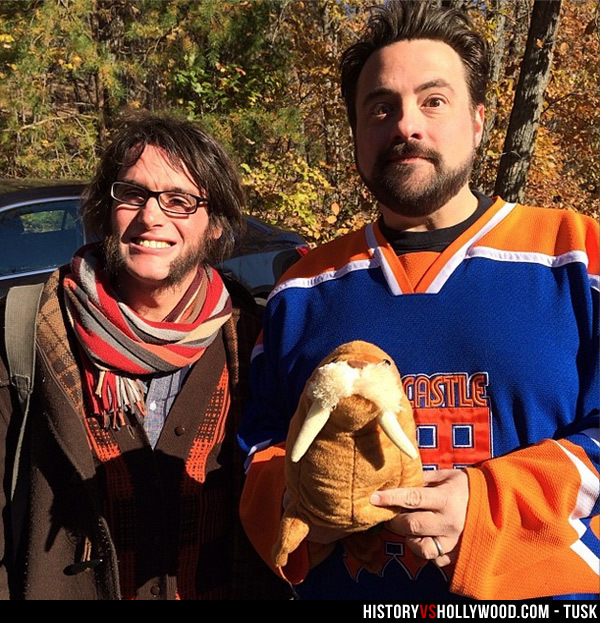 The man who helped inspire Tusk, Chris Parkinson (left), poses with writer/director Kevin Smith (right) and a walrus (center). Of all the 2014 movies one might guess are linked to true stories, Kevin Smith’s horror movie Tusk would probably not make the list. That is, unless your mind is as warped as some of the characters in the movie. Let’s pretend it’s not and that you’re surprised to learn that Tusk was loosely inspired by an ad posted on England’s free classified site Gumtree. The ad, posted by Brighton, England poet-writer/prankster Chris Parkinson, stated that a retired man was looking for a tenant and was willing to offer free rent to a person who was willing to dress up in a walrus costume for roughly two hours a day. Fascinated with Chris Parkinson’s Walrus ad, director Kevin Smith discussed it with co-host Scott Mosier on Smith’s SModcast podcast. Listen to the original podcast below, “SModcast #259: The Walrus and the Carpenter”. 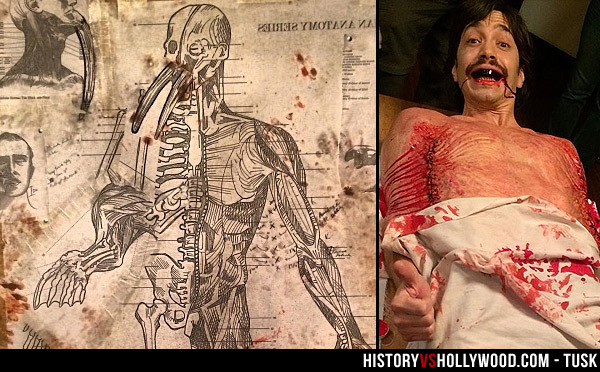 Listen to the podcast in which Kevin Smith comes up with the idea for the movie Tusk. Below is Chris Parkinson’s “Walrus” roommate ad that inspired the Tusk movie. Immediately following the image, the advert has been transcribed for easier reading. Read Chris Parkinson’s classified ad that inspired Tusk. Above is Chris Parkinson’s original 2013 ad that he posted to the British website Gumtree. The ad, which turned out to be a hoax, sparked Kevin Smith’s idea for Tusk. 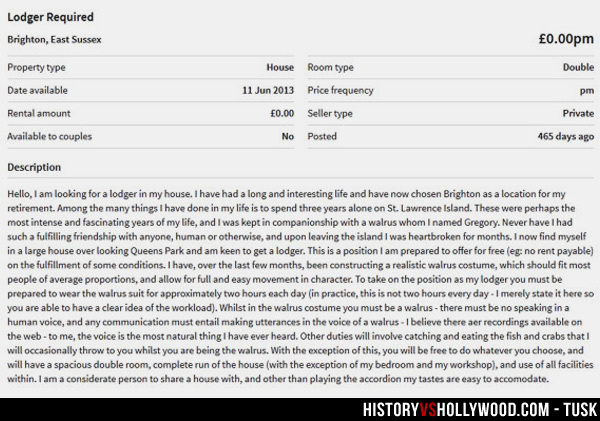 Hello, I am looking for a lodger in my house. I have had a long and interesting life and have now chosen Brighton as a location for my retirement. Among the many things I have done in my life is to spend three years alone on St. Lawrence Island. These were perhaps the most intense and fascinating years of my life, and I was kept in companionship with a walrus whom I named Gregory. Never have I had such a fulfilling friendship with anyone, human or otherwise, and upon leaving the island I was heartbroken for months. I now find myself in a large house over looking Queens Park and am keen to get a lodger. This is a position I am prepared to offer for free (eg: no rent payable) on the fulfillment of some conditions. I have, over the last few months, been constructing a realistic walrus costume, which should fit most people of average proportions, and allow for full and easy movement in character. To take on the position as my lodger you must be prepared to wear the walrus suit for approximately two hours each day (in practice, this is not two hours every day – I merely state it here so you are able to have a clear idea of the workload). Whilst in the walrus costume you must be a walrus – there must be no speaking in a human voice, and any communication must entail making utterances in the voice of a walrus – I believe there aer (SIC) recordings available on the web – to me, the voice is the most natural thing I have ever heard. Other duties will involve catching and eating the fish and crabs that I will occasionally throw to you whilst you are being the walrus. With the exception of this, you will be free to do whatever you choose, and will have a spacious double room, complete run of the house (with the exception of my bedroom and my workshop), and use of all facilities within. I am a considerate person to share a house with, and other than playing the accordion my tastes are easy to accomodate (SIC). 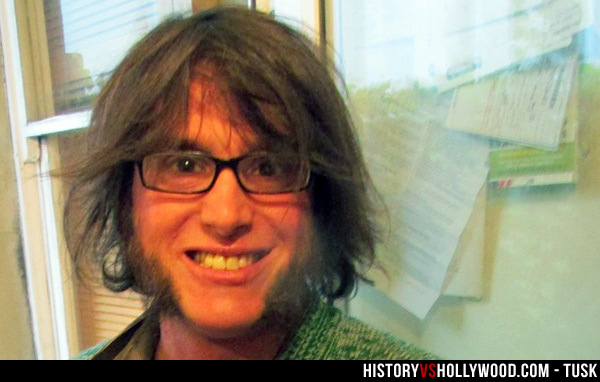 Prankster Chris Parkinson was given an executive producer credit on the movie Tusk for his role in inspiring the story. Chris Parkinson was given an executive producer title for being part of the inspiration for the movie Tusk, written and directed by Kevin Smith. 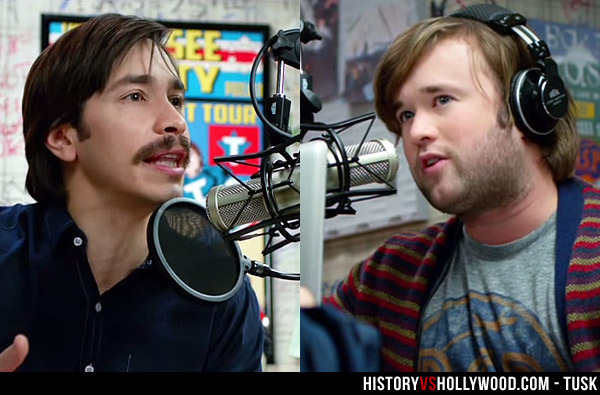 Justin Long and Haley Joel Osment’s characters’ podcast was inspired by director Kevin Smith’s experience hosting his own podcast (SModcast) with friend Scott Mosier. The original ad was posted on the British website Gumtree UK, not on the wall of a Canadian bar’s bathroom. 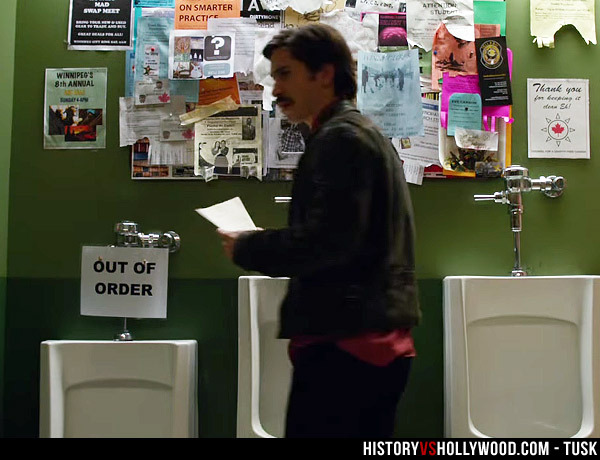 Wallace Bryton (Justin Long) discovers the ad in the Tusk movie. The original ad never specified the gender of the writer, but Chris Parkinson later stated he had imagined the person to be a retired older man. 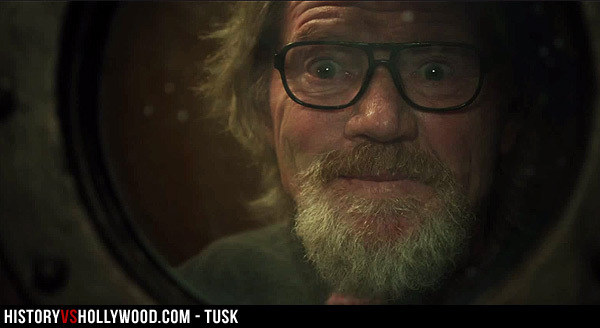 British actor Michael Parks portrays Howard Howe in the Kevin Smith movie Tusk. 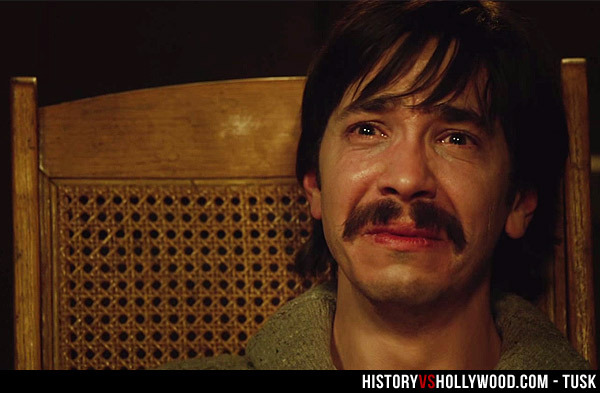 Justin Long’s character, Wallace Bryton, was named after the town where Chris Parkinson lives, Brighton, England (the spelling was changed due to a potential legal issue with the name). Parkinson’s advert only described dressing up in a walrus costume. Kevin Smith dreamed up the surgical modification part. Listen to UK prankster Chris Parkinson talk to Kevin Smith on the SModcast podcast. 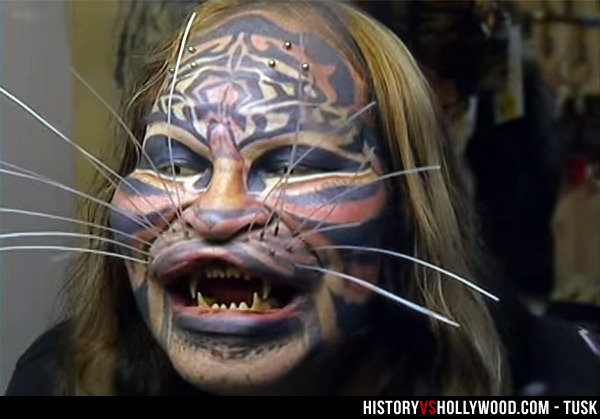 And if you’re wondering if real people have modified their bodies to look like animals, let’s not forget Cat Man (aka Stalking Cat), Dennis Avner. Albeit, his was voluntary.